ClubCoins Tarvita: 100 Please note that, for now, you cannot download content from our platform directly onto a mobile device (phone, iPod, iPad, tablets...). You need to download your items onto a PC or Mac, and then transfer them onto your device in the normal way. We are working on allowing direct downloads to mobile devices but this is not possible in the current version of the platform. Sorry about the inconvenience! Great salespeople are made, not born. The world's foremost producer of personal development and motivational audio programs now offers master motivator Zig Ziglar's secrets of sales success. You've heard about "e;natural-born salespeople"e; -- those super salespeople who seem to perform intuitively and succeed effortlessly. 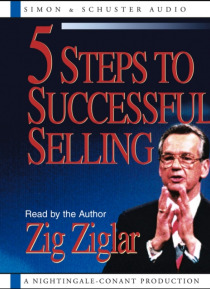 In 5 Steps To Successful Selling, Zig Ziglar shows you that thos… e success stories result from study and observation rather than inborn talent. They are the result of mastering the art of selling. Now you can master those techniques and perfect your own selling skills -- skills that will take you from being a good salesperson to being the best. A super salesman himself, Zig Ziglar draws on his many years of experience to define and explain the keys to successful selling: Prospecting: identifying who can and will buy Presenting: knowing the product and showing it effectively Closing: winning the sale Follow-up: maintaining customer contact Positive self-image: the foundation of success in selling After learning the 5 Steps To Successful Selling -- whether you are a beginner or a seasoned veteran -- you can't help but come away a better salesperson.